Arcadia Ales | Beer Apprentice - Craft Beer News, Reviews, Interviews and Info. Hello everyone. For today’s craft beer review I’m going to be trying the Arcadia Ales XV produced by the Arcadia Brewing Company located in Battle Creek, Michigan. I need to give a special shout out to Mr. Liquid Bread (aka. Chris Phillips) for sending me this rare brew that was only available at the brewery. From the website, arcadiaales.com, we find this bit of information about this particular beer. Brewed for Arcadia’s 15th anniversary. Malt beverage with cherries aged with french oak barrels. Note: NOT to be confused with Arcadia 15. Let’s drink this bad boy!!! This brew came in a 22 oz. bottle and, unfortunately, I have no idea about the ABV. It poured a relatively clear mixture of color from brown to ruby red to grape. An off white head was formed to a decent size with a fairly easy pour. It was slightly soapy and a few large bubbles were present right at the spot of the pour. The retention time was short and the lacing was a touch meager, however it did leave a ring of foam around the top as well as a nice film of alcohol on the sides of the snifter. The nose brought forth a beautiful dose of soured cherries. Some tartness, but not a tremendous amount however. Lovely woody/oak hints along with a very slight waft of dark bread. Definitely a red wine type of profile. Balanced pretty darn well I thought. Within the taste I found both cherries and grapes that produced a very manageable amount of sourness and tartness. Only the most faint vinegar savor. The breadiness was quite subdued too. The woody/oak popped in at the back end, but it wasn’t that forthcoming either. It was a great compliment and balancing act for the dark fruits however. It still tasted rather nice I must say. Just not overly robust or “loud”. The mouthfeel was medium bodied. Smooth, yet a little bit sharp and bitey at the very beginning. Kind of lively in regards to the carbonation too. Just a little smidgen of warmth was felt and not a whole lot of flavor was left behind on the palate after each sip. It vanished a little quicker than I thought it might. Overall, I thought this to be a pretty good beer. Solid and sturdy. Easily worth a try if you are able to obtain a bottle. It’s very easy to drink and very wine like. It started somewhat “meh” and uncomplicated, although as it warmed and moved along it became very nice and worthwhile. Again, I need to thank Mr. Liquid Bread for taking the time to ship this bottle to me. Be sure to check out his Beer Review Show mrliquidbread.wix.com/mrliquidbread sometime. Hilarious stuff to say the least. 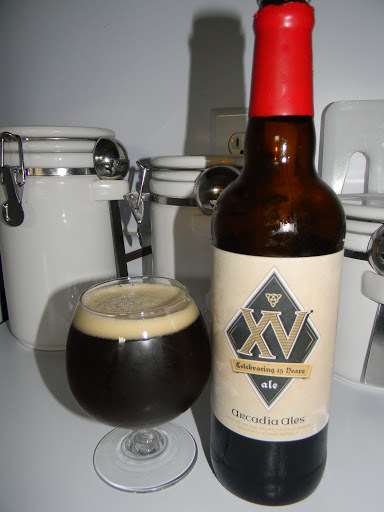 Also, if you have tried the Arcadia Ales XV let me know what you thought about it. Feel free to leave a comment anytime. Hello everyone. How’s everyone doing? Good I hope. Well, for today’s craft beer review I’m going to by trying the B-Craft Black produced by the Arcadia Brewing Company located in Battle Creek, Michigan. It’s been quite some time since I last reviewed a brew from Arcadia Ales, but thanks to the generosity of Mr. Liquid Bread, I’m able to once again try a brew that I otherwise wouldn’t be able to find. This big beer has a beautiful malt character to accompany the intense hop profile. Plus a hint of roast character. The B-Craft Black comes in a 12 oz. bottle with an ABV of 8.5%. This beer poured a black color with just a smidgen of ruby around the edges. The crown was light tan in color, sized nicely, smooth and somewhat creamy. The retention time was solid and the lacing was suitable. Not a bad looking beer at all. The nose divulged a nice bit of orange peel along with hints of grapefruit. Very fruity and citrusy. I also found the bouquet to be very piny, resiny and earthy. Not a tremendous amount of roast or malt I didn’t think. If I had been blind folded and didn’t know this was a Black IPA, I would have never guessed it from the aroma alone. The taste was more of the same. Grapefruit and orange citrus with a solid dose of pine hanging around. A very nice hop punch and bitter profile. Again, not much, if any, roastiness was to be found. Maybe my palate is broken or something. The mouthfeel was medium bodied. Very smooth, dry and crisp. Very good medium strength carbonation, which helped in leaving a decent amount of flavor behind on the roof of the mouth and tongue for a minute or two after each sip. Well, I think we have a very solid and sturdy Black IPA right here. 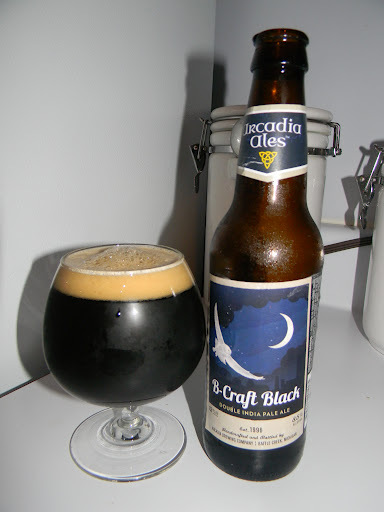 I, personally, have never been a huge fan of Black IPA’s, however I believe the Arcadia Ales B-Craft Black is one that I could have often. I’ve always been a bit perplexed and torn with the heavy hop profile and roasty mixture that this style encompasses. It’s kind of an oxymoron to me. With that being said, because this particular beer is less intense with the roast it was a bit more pleasing to my taste buds. I’d say give it a try if you are able to find it. It’s a very easy beer to drink and could be had at anytime of the year. 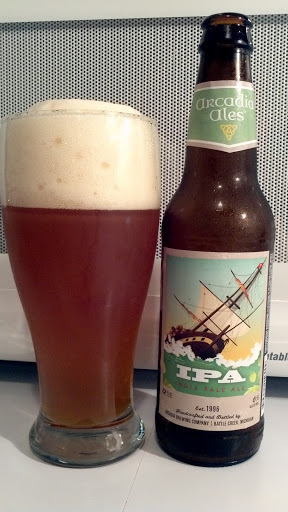 For today’s craft beer review I’m going to be sharing with you my tasting experience of the Arcadia Ales IPA produced by the Arcadia Brewing Company located in Battle Creek, Michigan. I have had the opportunity to try several Arcadia Ales brews and always thought that they were a very solid and underrated brewer, so I’m expecting the same from their IPA. Here’s the description of the IPA from the website, arcadiaales.com. Our IPA is the essence of “beer in balance”. Dry-hopped with Columbus hops in our open fermenters, our IPA boasts a bright floral aroma and flavor reminiscent of pine and lemon peel. The pronounced hop bitterness is balanced by a medium-bodied caramel and biscuity malt character with a nutty finish. True to the original English version of this style, our India Pale Ale showcases many subtle earthy bitter notes, rather than the resinous citrus-rind bite often featured in many American-style IPA’s. This unique, sessionable brew would have surely pleased British troops stationed in faraway lands. This brew has an ABV of 6.0% and comes in a 12 oz. bottle. The Arcadia Ales IPA poured a very hazy, deep orange color with some burnt yellow highlights showing around the bottom. The head was an off white color that was very full, fluffy, rocky and slightly soapy. The retention was adequate and the lacing was pretty nice too. The aroma started with a very, very pleasant, ripe peach note. It also conjured a light hint of pineapple along with a floral and piny hint. After the brew warmed a bit I started to detect a wonderful “round” biscuity fragrance that really helped tie it all together. I couldn’t help but continue to notice the peach though. It was the most well attuned fragrance in the nose in my opinion. Very nice. The taste brought forth even more of the wonderful peach savor. It presented a wee bit of grapefruit, but it was really slighted when standing next to the peach. I also discovered the most remote hint of pineapple and orange citrus. This beer had plenty of hop bite and bitterness. So much so as to bring out a minute tartness. Some biscuity malt was found, but it was not very forthcoming. A light caramel sweetness was tasted too, however it was kept at a bare minimum. Even though the description describes this beer as not being very citrusy, I certainly found plenty of it to enjoy. The mouthfeel was medium, dry, crisp and refreshing with quite a bit of snap and bite. The sharpness was a touch harsh at first, but as I continued to drink it became more relaxed and comfortable. The palate was left with a suitable amount of flavor until the next sip. Well. This brewery continues to surprise me. Like all Arcadia Ales I’ve tried, this one is an all around very solid and good beer. It had an attractive appearance, sturdy aroma and a very nice taste. The drinkability is pretty high, so I don’t think that I would have any problem setting a few of these back on a warm day by the BBQ grill. It’s definitely worth a try if you happen across it. I’m sure I will pick it up again sometime soon. Thanks guys. I appreciate all of the reads and comments. It means a whole lot to me.